5 Benefits of a Pop Up Trade Show Display | Displays and Exhibits, Inc.
1. Portable. If you need to ship your trade show displays ahead of time it can add substantial cost to your booth. Plus, there’s the uncertainty of whether everything will get there intact and on time. Pop up displays are portable, meaning you can bring them with you when you go. Not only does that nix the shipping cost, it also gives you confidence that everything will arrive. 2. Easy to assemble. It’s hard to say which is worse: spending hours struggling to assemble a booth that seems to have been made on Mars, or having to pay the extra cost to have trade show staff assemble your booth for you. Pop up displays are designed for fast, easy assembly—typically with no tools needed. Even lighting elements snap into place. 3. Customization. 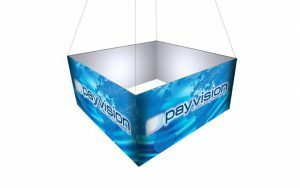 Most pop up trade show displays consist of printed panels on a frame. That means the panels can be printed with any graphic or series of graphics you like, whether it’s a single sprawling mural or a series of displays and marketing points. Pop up displays are highly customizable. 4. Reusable. For the same reason, a pop up trade show display is also highly reusable. Not only are the frames sturdy and able to go to show after show, but the panels can easily be switched out as your marketing evolves or your company focus shifts. The modular nature of the frames also allows for creative layout and use of your space. 5. Cost effective. Perhaps the biggest reason companies choose pop ups for their trade show displays is because of the cost to benefit ratio. Pop up displays offer stunning custom visuals and layout at a low price point, plus incredible versatility. Does your company use pop up displays for trade shows? What makes you prefer this style of display?